Funny thing, there's not much you can do with these cakes if you don't have mad decorating skills. I've tried icing around the tiers, but they end up looking like blobs. So the cake pan just sits and sits and sits. Until one day I had a brilliant idea. The tiered cakes are the perfect size to become dresses for the mini princess dolls that my daughter loves to play with and kudos to me for figuring this all out with just enough time to execute them for her 4th birthday. Phew! Here goes! Tip! I started with white pre-made icing and used gel food coloring. Since I didn't know how much I'd need for each "dress" and I didn't want to waste icing, I started with one color, in this case, blue. After icing the blue dress, I added more white icing to the bowl, then added red coloring. Blue and red make purple. When I was done with the purple I added more white icing which made a lighter purple for another dress. After that one I added more blue to make the darker blue of Ariel's dress. By doing this I didn't waste any icing and all my colors coordinated. Except poor Belle. My technique, if you can call it that, was to pile on too much icing to the top, then using a small offset spatula, pull down until everything was covered. Third, stick the dolls in. (Of course you will pre-wash them and tie Rapunzel's hair up.) Just push them straight down and through the center. Fourth, decorate to your hearts content. Belle. Belle suffered a few injuries when I accidentally dropped her when transferring onto the cake plate. Oops. Because I couldn't find any of the other princess dolls around the house, Pascal worked perfectly. When it was time to sing I moved him to the side to look as if he was climbing up and put a candle on top. Perfect! The Happy Birthday Girl: At first confused to what I had done with her dolls, then after I explained the dresses were cake she was all for it. 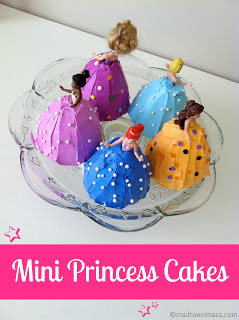 These are adorable, and a great idea for a little girls' birthday party, which I'm totally going to do for my daughter's 5th. I've seen cake pans like this at Williams Sonoma, is that where you got it? Totally cute!! Perfect use of the pan. I would probably sprinkle some powdered sugar on and feel like I'd really accomplished something, lol! Thanks for linking up!! These little cakes are cute and adorable! So darn cute! You did an amazing job! I want that pan! My grandma used to make me a doll cake for my Birthday when I was little. I made one for Priscilla when she turned one. But I know she would just LOVE these mini princesses. Great job, Mama! Thanks! They were so fun to do! I really liked looking at your Mini Princesses. I do some cake decorating and have made the larger doll cakes over the years. You did a very nice job on them and I think they are lovely. Keep it up. What a lucky girl - all those cute princesses! These are great! 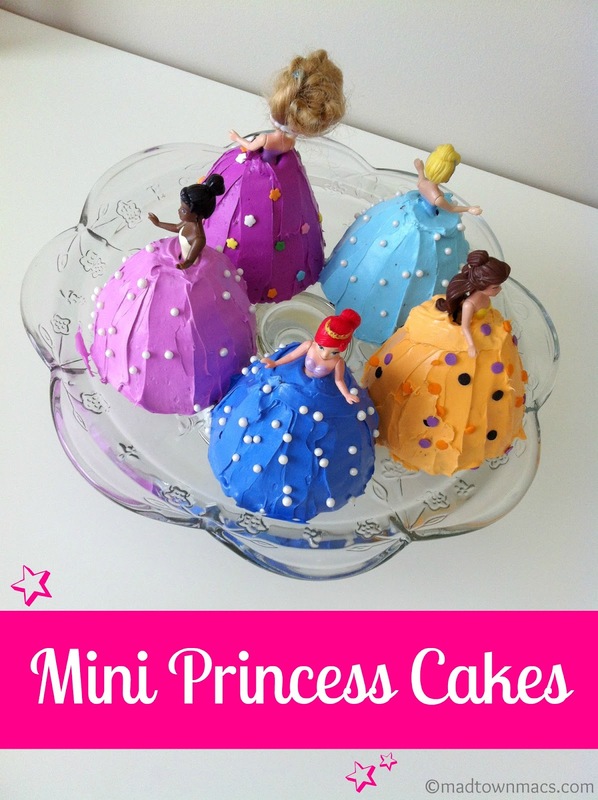 I want to make them for my daughter's 5th birthday party. Where did you get the rapunzel doll? I'd try Oriental Trading or the Dollar Store. Sounds like a great party idea. Good luck with it and have fun! Were these dolls in the dresses or down to just bare skin dolls? Where did you happen to get them? These dolls were not in dresses. I took their dresses off and stuck them down into the middle of the cakes, feet first. I'm guessing I got the dolls at Target (It's been more than 3 years ago since posting these cakes). They are the mini princess dolls that came with the rubbery, stretchy dresses that were a pain at times to get on and off the dolls. I'm guessing that's maybe why they went to the magiclip ones? I'd check Target, Walmart, Amazon or places like that. Good Luck and thanks for stopping by! I know it's a long time since you posted this, but do you have a recipe to share that you used with this cake pan? Did you just use a regular cake recipe and shorten the baking time? Thanks! I know it's a while since you posted this, but do you have a recipe that you used with this pan? Did you use a regular cake recipe and just shorten the baking time? Thanks! I want to try and do these for my daughter!s birthday. Hi Anjuli! I'm pretty sure I just used a box mix of chocolate cake - nothing fancy. Yes, keep an eye on them when baking, but I don't remember how long I left them in the oven. Also, grease the pan really well so that the cakes come out cleanly. Again, it's been awhile and I'm guessing I used some sort of spray (Pam) and then used a pastry brush to go around the inside to make sure all the nooks and crannies were coated. If you have time, it never hurts to do a test batch. Good luck and happy birthday to your daughter!